If you're trying to improve your diet, you're probably trying to reduce the calories you consume from alcohol. Many people find that they lose weight when they drink less. But some dieters believe that vodka calories are better for you than other booze calories. The fact is, however, calories in flavored vodka and regular vodka can add up just as quickly as the calories in wine and beer if you're not careful. When you make a drink with regular vodka, there are different brands and styles from which to choose. Some vodkas are made from potatoes and others are made from grain, such as wheat, barley, rye or corn. There are even some vodkas made from grapes. Each variety delivers a clean flavor that makes it taste like the drink is low cal. But is vodka low in calories? The actual number of calories in vodka depends on the amount of alcohol in the variety that you choose. Even though there are only 56 calories in a shot of 80 proof vodka, there are approximately 97 calories in a taller shot (1.5 ounces) in the 80-90 proof range. So even if vodka tastes light and clean, it still provides almost as many calories as many other types of alcohol. If you choose a vodka brand with more alcohol, the number of calories goes up as well. If you drink 100-proof vodka or even 120-proof vodka, the estimated calorie count goes up to 124. Several companies have created flavored vodkas that provide a little extra zest. Many drinkers wonder if they take on more calories with the extra boost of flavor. Usually not, according to manufacturers. In fact, you may even be able to consume fewer calories with a flavored vodka. Ciroc Coconut Vodka provides 94 calories per shot, about the same as the unflavored variety. Smirnoff Citrus Vodka has 87 calories per shot, according to CalorieKing, just a few less than the non-flavored version. Many flavored vodkas also contain less alcohol. And what about bacon flavored vodka? It certainly seems like a drink that would provide more calories and even some fat. But according to several sources, a single ounce of bacon-flavored vodka provides about 70 calories. So, a 1.5-ounce shot would contain about 105 calories—not much more than most other flavored vodkas. Some companies make low-calorie flavored vodkas. Smirnoff Light Lemon Sorbet Vodka, for example, contains 78 calories per 43-gram (1.5-ounce) serving. Voli Vanilla Espresso contains 81 calories per serving. And, according to the SkinnyGirl website, all of their naturally flavored vodkas contain 75.8 calories per serving. There are zero carbs in vodka. There is no fat in vodka. Vodka is not a source of vitamins or minerals. Does Vodka Provide Health Benefits? Some drinkers enjoy the taste and the effects of drinking vodka and prefer the clear alcohol over other adult beverages such as beer, wine, or dark liquors. But is vodka better for your diet than other forms of alcohol? 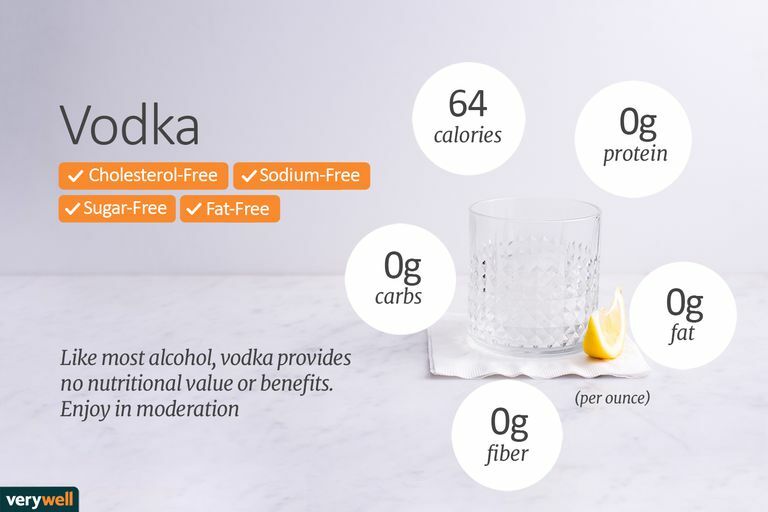 Some low-carb dieters prefer vodka because it provides no sugar or carbohydrates (as long as you drink it without a sugary mixer). Most varieties of wine and beer provide carbs and some sugar. Other drinkers believe that vodka is better for you because this light-colored liquor is less likely to induce a hangover. But whether or not you get a hangover has much more to do with how much you drink rather than what kind of alcohol you drink. There is no "better" alcohol. Alcoholic drinks provide no nutritional value and booze provides no health benefits. So if you choose to indulge you should enjoy the variety you like in moderation. Even though many flavored vodkas already provide fewer calories, choosing them may help you to reduce your calorie count even further. Why? Because the extra flavor in the alcohol may allow you to ditch the mixer. It's usually the mixer that makes the calories go up, so if you eliminate it, you'll also decrease the calories in your vodka drink. And, of course, the best way to reduce the calories in any drink is to measure your portion size and consume with caution. If you drink too much, you're likely to eat more while you're imbibing and move less on the following day. So enjoy the calories in flavored vodka or traditional vodka the same way you enjoy any treat—in moderation. If you have an allergy or intolerance to the ingredients used to make vodka, you may experience an allergic reaction if you consume vodka. For example, people with a wheat allergy, celiac disease, or gluten intolerance may want to avoid vodka made from grains. In some cases, distilled liquors are safe for consumption, but it is also possible to have a reaction. It is also possible to have an allergy to alcohol. Lastly, alcohol is not recommended when you take certain medications, especially those that cause sleepiness. Be sure to check with your healthcare provider before consuming alcohol while on medication.